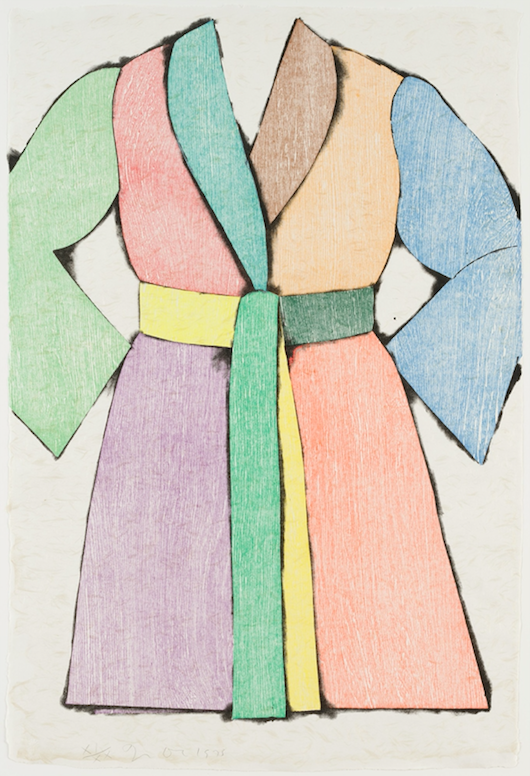 Jim Dine, The Woodcut Bathrobe, 1975. Courtesy of Museum of Modern Art. Comrade of leisure, a witness to my secret thoughts! Could never touch my dreaming mind. And reconciled once again with my abandoned home. And dreams and reveries caressed me. Enlivened my deep languor’s dream. I painted castles in the air. In company of memory and hope. A fancy whispered to me yesterday. Was warm, she favoured my informal attitude. My smile untouched by labour’s traces. He brushed with immortality in play. But still in indolence with him I can compete. Like him, I love my idle, peaceful dreams. Forgive me! Your disloyal friend will leave you. Succumb to this alluring bait. Prevents us separating truth from lies? Wind up? Where does this journey end? That swarm before them swinging censers? I cannot follow her commands. My every step betrays my awkwardness. Mayhap a trace of shameful failure. O dressing gown, forever welcoming! In you I shall again find pleasure. That used to crown my spring with flowers. To find my former self within myself. All I have seen in wakefulness. Prince Piotr Viazemsky (1792-1878) was a prominent player during the golden age of Russian poetry, and a close friend of Pushkin. Dressing Gown Farewell was written at the Viazemsky family seat in Ostafevo, near Moscow. The day dawned bleak and chill, a moving wall of grey light out of the north-east which, instead of dissolving into moisture, seemed to disintegrate into minute and venomous particles, like dust that, when Dilsey opened the door of the cabin and emerged, needled laterally into her flesh, precipitating not so much a moisture as a substance partaking of the quality of thin, not quite congealed oil. He thought of Lydia and wondered what it was that had gone wrong. He had felt her drifting away from him like the cloud in the windowpane. He’d just stood there. Until she collected her things, kissed him on the mouth and walked out of the door. The cardboard box had remained. It was filled with her. Her touch, her kindness, her skin. He held the piece of leather in his hands and gently folded it back into the box.